It has long been a source of frustration to cat breeders that you can’t get the lovely tricolour cat pattern also known as the calico cat, to breed true. Here’s why. Female mammals have two X chromosomes. (There are a few individual and species exceptions, as always.) Two X chromosomes is one too many and so one has to be shut down in order (presumably) to keep gene dosage at the same level as that in the male. Very early in embryogenesis, when a female mammalian embryo is a small ball of cells, one X chromosome is inactivated in each cell. This inactivated X moves to the outer edge of the nucleus and sits there visible in the light microscope as a Barr body. (Named for Murray Barr who first discovered it.) The timing varies between species so when cats have X inactivation is different in development from when humans have it. Which of the two X chromosomes was silenced in a particular embryonic cell is generally random. Once silenced, that inactivated X is carried on during all future mitoses. There is a gene for coat pigmentation in cats that is also located on the X chromosome. Since females have two X chromosomes they also have two genes for pigmentation. In the female cat, one gene for coat color is shut off when the X is inactivated. If a female cat happens to get an orange gene from one parent and a black gene from the other (she is a heterozygote, i.e. the alleles are different), then during early embryogenesis, the cat will have some cells with only a working orange pigment gene and others cells will have only the black gene working. Both genes, one from the mother and one from the father, are present. Only one is used in each cell because the other is coiled up and sequestered on the inactive X. The gene for coat pigmentation doesn’t actually “work” until much later in development. Recall the neural crest cells that break free from the boundary zone of the neural ectoderm and the epithelial ectoderm during neural tube closure (Chapter 2). These neural crest cells migrate out and later on some of them form the pigment cells that give us the color we see on the cat. When it is time for the genes to be turned on about half of the calico cat’s cells have only the orange gene turned on and half have the black gene turned on. The pigment cells migrate to their place and then do several rounds of replication to produce patches that are all clones of the first cell to migrate into an area. These patches of cells replicate and expand until they meet cells from another clone. The cat continues developing and the result is the orange and black blotch pattern we see on her coat. The calico cat has one X chromosome inactivated in each cell and the inactivation of that one X is for her entire life. The inactivated state of this X chromosome is transmitted to all copies of that chromosome during subsequent cell divisions and their mitoses. All mechanisms, including DNA methylation, histone modifications and coating by various RNAs such as Xist, that are involved in the transmission of the state of a gene from a cell to its daughter cell at mitosis, are transmitted by bookmarking (Chapter 3). Bookmarking is transmission of a cell’s “memory” to its progeny. Yet, when a calico cat has kittens she can pass on either the orange gene or the black gene to each of her babies and her kittens will not have the same pattern of inactivation. The male kittens she has will each get one X chromosome from her and one Y chromosome from their father. Because the pigment gene is only on the X chromosome any male kittens will be either orange or black and he will inherit only one of his mother’s coat color genes. What color her female kittens are depends on the both parents’ contribution. If the father is black, he will always contribute one X chromosome with the black gene. The mother can contribute either a black or orange gene. The female kittens will be either black and orange like her or all black, depending on which X they got from their mother. If the father is orange, the reverse happens and the female kittens will be orange or orange and black. The all orange and all black female kittens will undergo their own X inactivation in early development and be just as much mosaics as their prettier calico sisters but the X inactivation pattern will be invisible. X inactivation is “reset” with each generation. X inactivation was originally discovered by a female scientist Mary Frances Lyon FRS (15 May 1925 – 25 December 2014). Another term for X inactivation is Lyonization. This post contains excerpts from Chapter 4 of our upcoming book Embyrogenesis Explained. Figure Caption: The calico cat is a female cat ♀ with white underparts. The gene for color is located on the X chromosome (vertical line with circle under a cat). The female cat has two X chromosomes and therefore two color pigment genes (two vertical lines with orange and black circles). When the cat embryo reaches about 64 cells X inactivation of one X in each cell occurs. (Nowack, R. (1993). 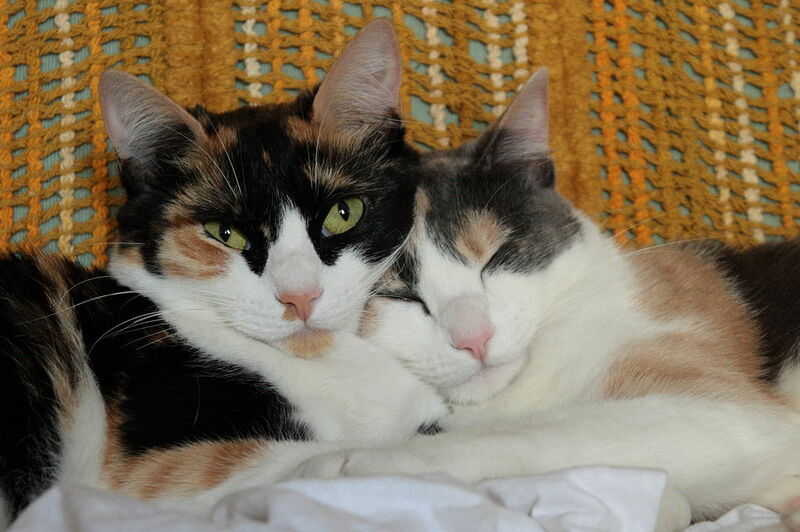 Curious X-inactivation facts about calico cats. NIH Res. 5, 60-65. )The result as it grows is patches of yellow and patches of black in the kitten. Male cats ♂ have only one X chromosome and one Y chromosome (short, vertical grey line) and so are either all black or all orange. The gene which creates white, pigmentless patches is inherited independently of the color genes and is not located on the X chromosome. When a calico cat has kittens she can have an all black or an all yellow daughter with probability ¼, but not both. Which solid color daughter she has depends on the color gene on the X chromosome contributed by the father (left: black father, right: orange father). This is why people often say all orange female cats are relatively rare and why there are no normal male calico cats. This entry was posted in Nerdy Tumbleweeds and tagged cats, developmental biology, embryology, epigenetics, Lyonization, X inactivation on September 30, 2015 by tumbleweedstumbling.